Last year I wrote a blog post about my experience of comparing the flavour of organic vs conventionally farmed vegetables. It generated some great discussion in the comments and a few people made reference to the ‘dirty dozen’. At the time I wasn’t really sure what they were talking about. Then recently the ‘dirty dozen’ crossed my path again in Nina Planck’s book Real Food. So what is this mysterious ‘dirty dozen’? It’s a list of fruit and veg with the highest levels of pesticides put together by the Environmental Working Group. Planck also included the ‘cleanest 12’ from the same source. Basically if you can’t afford to buy organic produce all the time, you can minimise your exposure to pesticides without spending a fortune. Just avoid conventionally farmed produce from the ‘dirty dozen’ list and instead choose conventional produce from the ‘clean’ list. Why I have included a recipe for broccoli? If you spotted that broccoli isn’t on either list, well done! Here’s the thing, when I was planning this post, I referred to the list in Planck’s book published in 2009. Which did include broccoli in the ‘cleanest 12’. So what’s happened to broccoli? Has it gotten dirtier? I’ve been roasting cauliflower for ages but it wasn’t until a few weeks ago that I even thought to try roasting broccoli. I’m happy to report that the results were seriously good – with a lovely complex deep flavour – a whole world away from boring old boiled broccoli. It does take a little longer, but you can easily do other things while the broccoli happily roasts away. The other thing I love about this dish is slicing the broccoli. It gives more interesting textures than when the broccoli is chopped into florettes like usual. 1. Preheat your oven to 200C (400F). 2. Slice broccoli lengthwise into slices about 1cm (1/2in) thick. Drizzle with a little oil. 3. Roast for about 20 minutes or until the brocc is tender and browned on the edges. Drizzle with vinegar. 4. Meanwhile mash feta with the yoghurt and spread on the base of 2 plates. Top with cooked broccoli. 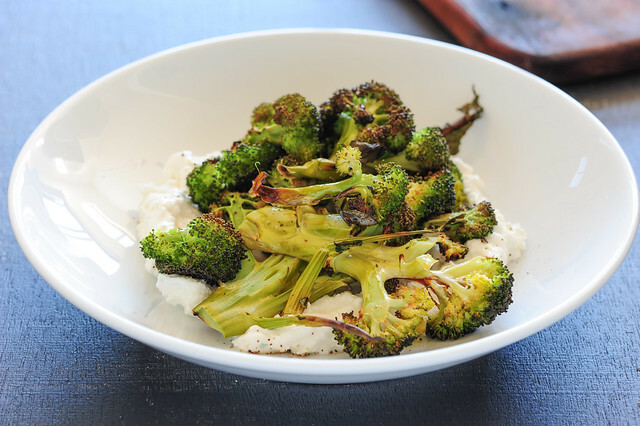 vegan / dairy-free – serve roast broccoli on a bed of hummus instead of the creamy feta. more substantial – toss in a drained can of chickpeas with the broccoli. hot! – serve drizzled with chilli oil or your favourite hot sauce. carnivore – slice some chorizo and roast in with the broccoli. cauliflower – replace broccoli with a large head of cauli. ps. Looking for simple Healthy recipes? It is an interesting list. Though I guess it varies from country to country. I love this concept of eating healthy on a budget, it is exactly what I am trying to achieve. It is great you’ve included this list – people often do not realised the harm in pesticides. I was blissfully unaware for quite a while, unfortunately, until 4-5 years ago, when my guinea pig got a serious problem with its tummy. The vet said that it was precicely food high in pesticides and chemicals that cause this. Even though people’s systems are stronger, pesticides still have the same toxic effect! I was shocked that apples are number one – scary, since I eat a whole load of them daily. PS. I tried the recipe today, but I spiced up the yoghurt and feta mix with some cumin and chillies! YUUUM! Next time I will add some sweet potato in as well, to make it a whole meal. Glad you liked the recipe Tony! Wow, that’s really interesting! It looks like the ingredients on the “clean” side are foods that generally peel or have a thick skin, which makes sense, but I was surprised about the mushrooms. Mushrooms do peel, but they are incredibly absorbent. I’ll have to read more into this, it’s so interesting! It sounds interesting…I am going to check it out from the library. Can’t wait to see your veggie patch Nai Nai… an apple tree or two sounds like a great idea! I have heard of this before also, but as stated by Zeeona above, have always wondered how this would work in Australia as I assumed this was tested on US produce. Do Aus farmers use the same chemicals and farming methods? I don’t know!!! Food for thought. I have also seen on American blogs using a vinegar based solution to wash your veges rather than just water. I just love your recipes. I’m trying to simplify my life in all areas, and your recipes are just perfect in that sense. At first I thought I wouldn’t like them, that the dishes were simply too… simple. But it’s amazing how complex tastes evolve when they are not drenched in other ingredients and spices. I’m staying at a hotel right now, and I just had your tuna-in-a-bag-of-salad for dinner. Loved it! I know what you mean about my recipes seeming too simple… I’m often surprising myself! Roast broc is amazing. A fantastic quick and easy dinner is roast broc and prawns. Just put broc florets and individual prawns (I use snap frozen ones, from a packet I keep in the freezer) on a baking sheet, spray with olive oil. Roast. Delicious. Yay for roast brocc Kristen! Oh and PS – I travel every week and I LIVE on that tuna in a bag salad! This broccoli recipe sounds amazing, and it looks even more delicious! What if I don’t have rice vinegar? I have apple cider vinegar, but would that taste really gross? I’m not much of a chef. P.S. Thanks for always having a vegan alternative. I appreciate that so much! just tried the roast broccoli with a bit of roast cauliflower and carrots as well – have been looking for an alternative to boring old steamed veg and think I just found it! Yum! I love broccoli and cauliflower. I eat them raw. I eat them steamed with butter and/or lemon. So far I haven’t gotten bored with them that way. They are offered up with white sauce or cheese sauce at restaurants. I don’t like those sauces as I think they dimenish the flavour of delicious broccoli and cauliflower. I will try this recipe next time I buy some broccoli and cauliflower. I’ll try it with hummus or maybe beetroot ‘hummus’. Red and green should be very colorful. Can you tell me where you got your ring? Can’t wait to try that broccoli, it sounds great! In response to Jocelyn’s query, according to a Friends of the Earth study, the top 10 Australian foods showing chemical residue were ( in order): apples, wheat, strawberries, pears, grapes, lettuce, nectarines, peaches, bread and bran. I read about this in August 2012 organic gardener magazine. The lists are pretty similiar, but I guess the US testing did not include wheat and bread. Jules, I just found your blog and today’s dinner consisted of 2 stonesoup recipes: the tofu steaks with chimichurri with roasted broccoli on the side instead of the spinach. Easy and delicious! So, now, we have 2 more recipes in queue for this week. Can’t wait! So glad you’re enjoying Paula! I’m interested to see that mushrooms are on the ‘clean’ list. I’m at Oxford, and my lecturer on sustainable agriculture tells us often that the *only* thing to buy organic is mushrooms; this is because – non-organically farmed- they are sprayed literally every few seconds with pesticide to stop flies landing on and eating them. Since mushrooms are upwards of 90% water, this means that they absorb all these chemicals very readily.